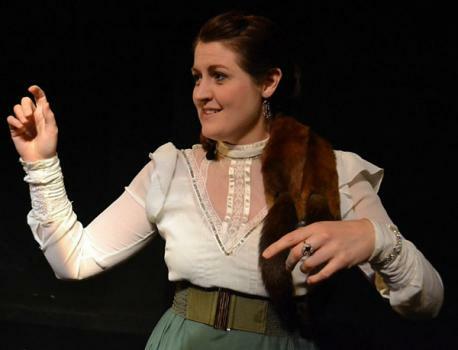 Hannah Davies in her self-penned one-woman show on Githa Sowerby, author of the extraordinary drama ‘Rutherford and Son’, currently playing at St James Theatre. 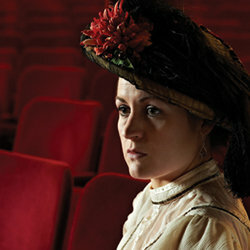 In the perfect companion piece, actress and writer Hannah Davies plays Katherine Githa Sowerby, children’s writer and author of “Rutherford and Son”, the gripping drama set in the industrial North currently playing in the main house at St James Theatre (see review). This beautifully written one-woman show, directed by Peter Darney, is the result of a collaboration with Yorkshire theatre practitioners The Flanagan Collective. The piece is not simply the story of Githa herself, the demands placed on her by her family, and the difficulties of being accepted as a woman writing about such gritty subject-matter, but also about the act of writing itself and the reasons why we – and she – created. Githa is well portrayed as both shy and unassuming, but with deep passions stirring beneath. Her character and mannerisms are contrasted sharply with her nervous sister Millicent, crippled but socially ambitious younger sister, hearty actress friend, the female activist that so inspired Githa and her humourist loving husband. There is also the nosy, somewhat judgemental London landlady . So well is the world she inhabits created, we sometimes ‘see’ three people ‘interacting’, especially when the sisters must part, when there is only one. There are moments of humour, particularly in seeing Githa’s awkward responses to the acclaim the play receives and the attention she is getting, and her interest in possible future freedoms for women, such as the prospect of wearing trousers, but the shock rooted in her time at the very suggestion she should wear them herself! We also see the frustration of a woman wanting to be seen on her own terms as a woman playwright, and her struggle to balance her emotional need to write with the needs, especially financial, of her family. She was fortunate in finding a husband so relatively late in life, who understood her as well as he did, even if he erred on the side of over-gallant and protective in dealing with her business affairs. There is an especially powerful scene when she expresses her anger and sense of betrayal over this issue. The end, though inconclusive, is nevertheless quite powerful as we see her struggling to rise to new challenges, including the horrors of the Great War pending. There is a spareness and economy about the production which belies the skills employed, both in the production values and the acting of the artist. As a true reflection of the character of Githa herself, Davies’s unostentatious skill is shared by the designers of the lighting (Sherry Coenen)and sound (Jon Hughes). The set is very simple with just a chair and trunk, which becomes in turn a desk, tea table or lectern; the lighting is unobtrusive but effective, and the real, usually unsung, hero is the wonderful soundscape adding subtle but greatly evocative atmosphere, really transporting us to the sounds and streets of 1912. A layered piece of writing, produced and played with excellent craftsmanship, this is very good theatre. This entry was posted in Theatre Reviews and tagged fiona jane weston, Githa Sowerby, Hannah Davies, Jon Hughes, Peter Darney, Rutherford and Son, Sherry Coenen, St james Studio, St james Theatre, The Flanagan Collective. Bookmark the permalink.